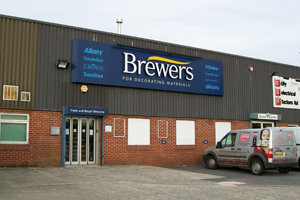 Our Barnstaple Brewers branch has an excellent choice of paints and wallpapers in store, as well as kiosks allowing you to browse products online and order for store delivery, as well as a large number of wallpaper and fabric books. We also arrange deliveries from stock in the local area. We’re directly opposite the MINI and BMW dealerships on Howard Avenue; a minute’s drive from Eastern Avenue. Look out for the McDonald’s on the roundabout and turn onto Hollowtree Road there. We’re a friendly team, so if you have any problems finding us, just call and we’ll guide you in! Once here, you’ll find lots of parking, level access suitable for anyone with mobility issues, and a warm welcome.